Download the app on the AppStore! 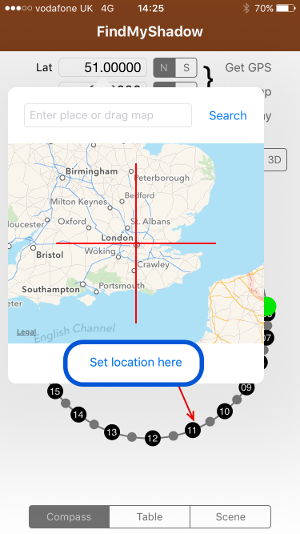 The home screen when you load the app automatically tries to use the device GPS (if you allow it when prompted) to get your current location and the clock for the current date. Both these can be overridden through the settings available on this screen. The timezone is NOT automatically ascertained from your location nor the clock and will default to GMT+0. 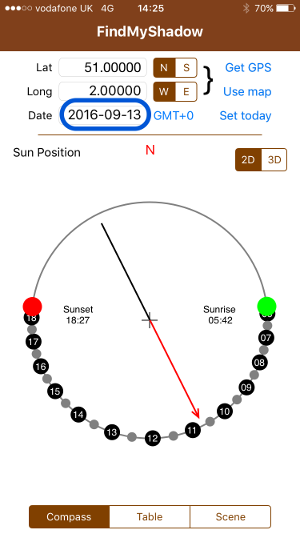 The screen shows the positions of the sun on a compass from sunrise (green, with sunrise time labelled) to sunset (red, with sunset time labelled) and for the hours in between. The 2D | 2D selector allows you to select between a flat representation of the angle with the sun at the edge of the circle, to a 3D representation to take height into account - ie when the sun is directly upwards in the sky the position indicated on the compass plot is at the centre vs. on the circle edge when the sun is down at the horizon. The date can be changed by clicking the text box which will pop up a date carousel for selection. The position of the sun varies through the year for longer and shorter days between winter and summer solstice. The timezone used to report results can be changed by clicking on the blue link (initially set to GMT+0 = Greenwich Mean Time [London]). If you don't set it to the timezone local to the location, the results may appear strange, with sunrise in the afternoon and sunset in the morning! 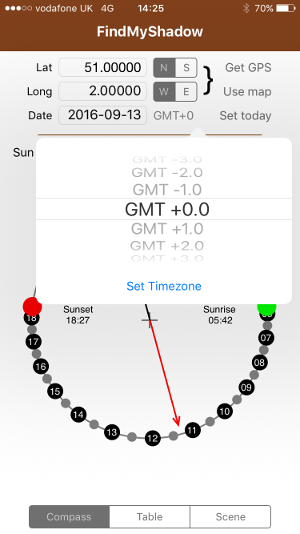 If the date you're interested in is during daylight saving time, you can add an hour to the usual timezone to get the correct 'local' time (eg in Britain you would choose GMT+1 for the summer months. 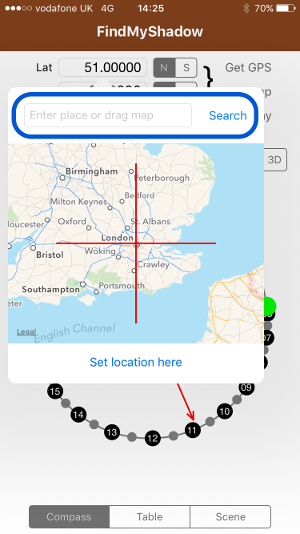 ...or you can enter a location, postcode etc and click Search to jump to that location using Apple's mapping API. REMEMBER to click "Set location here" once you're satisfied with the position, else the map will disappear without changes being made. The next panel shows the sun's position in tabulated form. The azimuth is the direction from true north, and the altitude is the height above the horizon at 0, with 90 degrees being straight up. 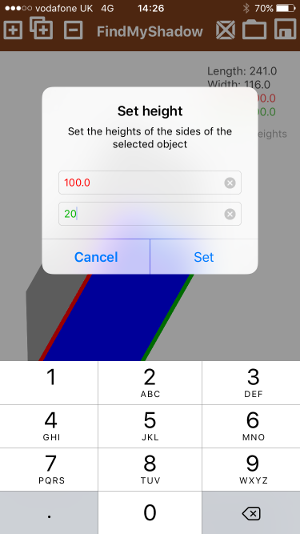 The Shadow Multiplyer is a scaling factor that takes the impact of the angle on a shadow into account and removes the need for you to do any trigonometry yourself. The scene drawing tool allows you to position shadow-casting blocks in a scene and see the shadows changing over the course of a day. Blocks are rectangular based and can have two facing sides set at different heights. 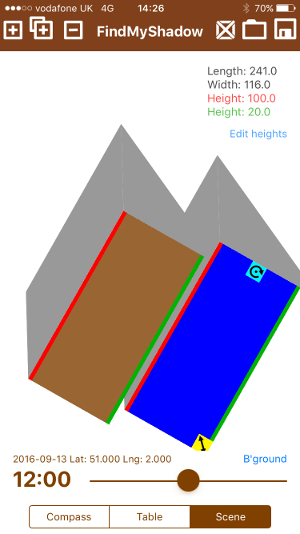 This model allows for the drawing of most basic house structures through joining multiple blocks. To add your first object, press the "+" button top left. 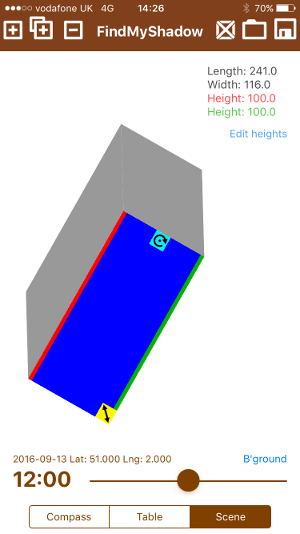 The block is shown in blue, it's shadow in grey. 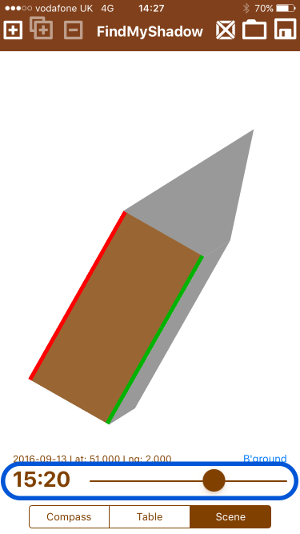 There is a red edge and a green edge which can be set to different heights. 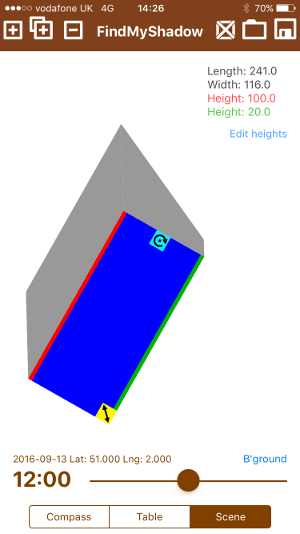 Whilst selected (highlighted blue) the figures to the top right of the canvas are the relative size of the block in universal units (pixels). You can choose your own scale factor, for example in this image you could say the 100 pixels is 3 metres width, and make everything you draw use the same factor (ie if it's 1 metre high, you'd choose 33 units or pixels for the height, being 100/3. 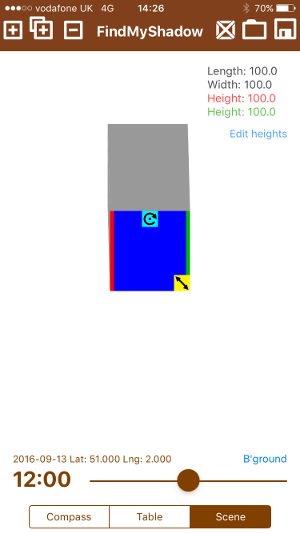 You can then drag, stretch and resize using the yellow corner arrow handle or by pinching, and rotate by turning two fingers or using the light blue / cyan rotation handle at the top of the object. 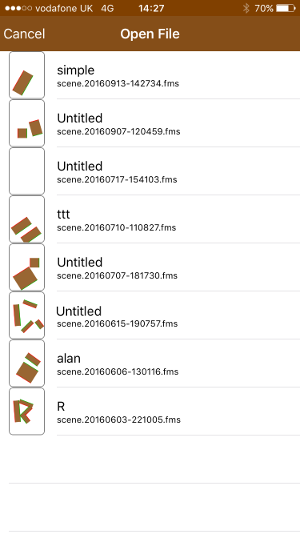 You can add more objects using the "+" button (notice the currently active object to which the size panel figures relate is shown in blue with the rotate and resize handles. 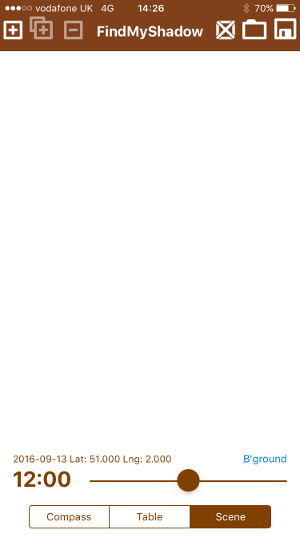 Deselected objects are brown. 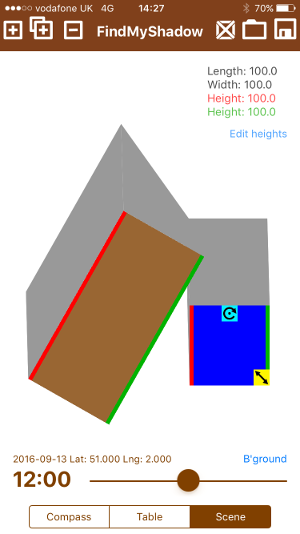 The double-plus icon is the clone tool, which will create a new object with the same parameters as the currently selected object - useful if youre creating a lot of similar items, or two halves of the same house when building a ridge structure. 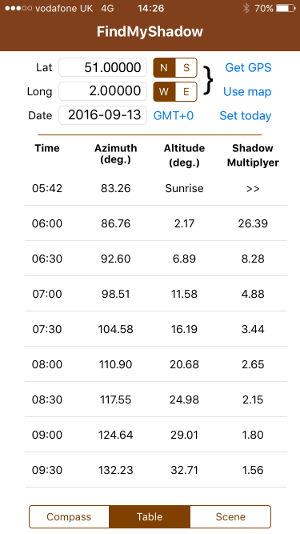 To see the shadows cast at different times of te selected day, slide the slider left and right. 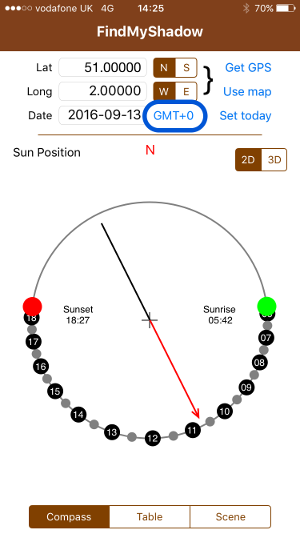 NOTICE that the location, date and timezone for the scene are all set in the main compass screen which you can switch back to without losing changes to the drawing at any time. 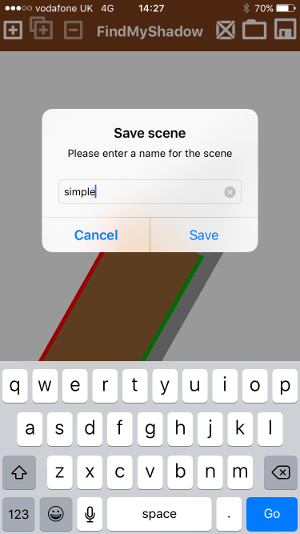 You can save your scene using the diskette icon in the top right - just give it a name. Note this saves the scene but NOT the location, date, timezone or background image. It is possible to set a background image for the scene to aid in positioning elements and to give better context. 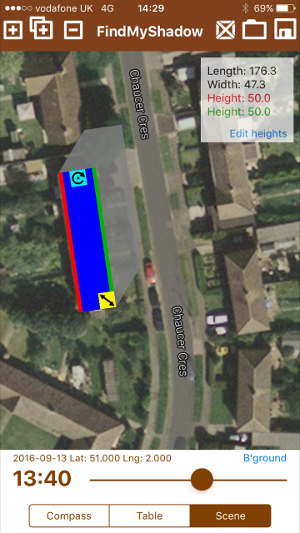 A map screenshot taken from your favourite maps app might be a great starting point! Click the background image link and choose from your camera roll (maps integration itself is not planned at this time). To clear the image, click change background and then select Cancel. 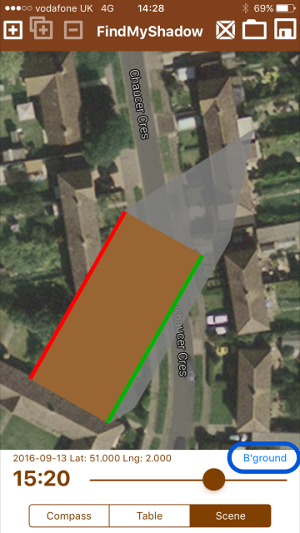 This example view shows an object overlaid onto buildings shown on the satellite image and with the heights approximately set to the same as the object width. Often these kinds of estimated size settings are sufficient to get a good idea of shadows in a scene. There is no defined limit to the number of objects you can add. On an iPad you have a lot more scope as eventually it becomes hard to manipulate everything without it getting in the way. I hope you enjoy using the app and if you have problems or feature requests I'd love to hear from you on email or on my facebook page!